Photo of: East Coast of Ireland: Meath: Newgrange. 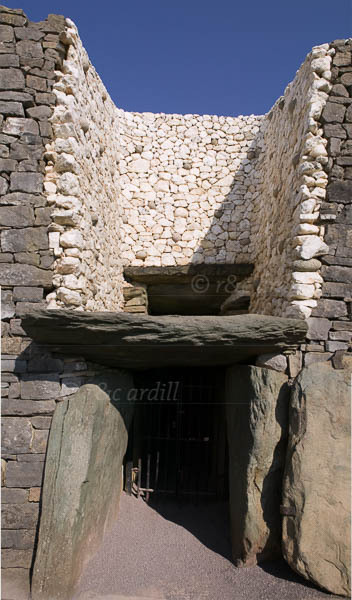 The entrance to the Newgrange passage tomb. Above the entrance to the passage there is a opening called a roof-box. This baffling orifice held a great surprise for those who unearthed it. Its purpose is to allow sunlight to penetrate the chamber on the shortest days of the year, around December 21, the winter solstice. At dawn, from December 19th to 23rd, a narrow beam of light penetrates the roof-box and reaches the floor of the chamber, gradually extending to the rear of the chamber. As the sun rises higher, the beam widens within the chamber so that the whole room becomes dramatically illuminated.